The 23-year-old keeper, who left Sunderland for Everton last month in a deal which could eventually be worth Â£30million, worked with Grayson during a loan spell at Preston during the 2015-16 season. And Pickford believes the new boss can make a significant impact on Wearside. He told the club's official website, www.safc.com: "I went to Preston to cross those bridges, to become the best keeper I can be. "I got the opportunity to go to work with Simon and his staff there and it was a massive help for me. He plays a good style of football as well, and it's what I think Sunderland needed, really. "I think he will be great for the club." 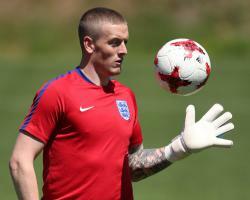 Pickford was speaking after returning to Sunderland's Academy of Light training headquarters to say his goodbyes, with his move going through while he was at the European Under-21s Championship with England. However, the Washington-born keeper intends to be back on Wearside as often as he can to lend his support to the club he has followed since his schooldays. I might get myself in the South Stand."